The 2012 CCM Opera Scholarship will take place Saturday, March 31st starting at 10:00 am in Corbett Auditorium. Singers compete for over $70,000 in scholarships and prize money. This Competition is open to the public and audiences are encouraged to attend. Judges for the competition this year are: Metropolitan Opera singer Claudia Catania, renowned Metropolitan Opera Stage Director, Fabrizio Melano and Stage Director and Artistic Director of Opera Theatre of Saint, James Robinson. A reception following the competition will be held in the Baur Room where the judges will announce their decision. Atlanta Opera offered an opportunity for composers and librettists to compete in a exciting and one of a kind opportunity called the 24-Hour Opera Project. Composers, librettists, stage directors, and singers all participated in the 24-Hour Opera Project. Composers and librettists were randomly paired together, and had 12 hours to write an opera scene. At the end of 12 hours, the pieces were assigned to a stage director, who picked singers from a pool of applicants, and had 8 hours to rehearse before presenting the pieces in a showcase-concert 24 hours after the project began. CCM Opera’s Jonathan Stinson was selected from a national pool of composers to participate. 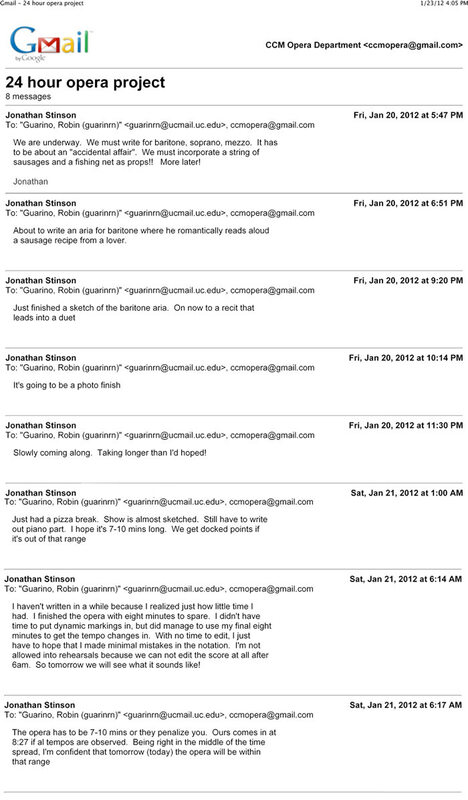 This is the exchange between Jonathan and Robin Guarino as the clock started. Atlanta Opera’s blog also chronicled the event from the 2011 24-Hour Opera Project. CET’s Digital Arts channel broadcasted this panel discussion at 10 p.m. on Tuesday, Nov. 29. on channel 48.3 (Time Warner channel 987). Learn more about the panel discussion here or visit the CET Connect website for more detailed scheduling information. Stage director and specialist on Shakespeare, Daniel Fish will be in residence at CCM Opera giving a workshop on speaking Shakespeare. Daniel Fish is a stage director based in New York City and Berlin. He began his career directing the plays of Shakespeare and Moliere and in recent years has made new work from sources as varied as Elliott Smith’s album FROM A BASEMENT ON A HILL, and Rodgers and Hammerstein’s OKLAHOMA. He has directed plays by Chekhov, Ibsen, Oscar Wilde, Clifford Odets, Charles L. Mee, Sarah Ruhl, David Rabe, Roland Schimmelpfennig and Sheila Callaghan. In New York City, his work has been produced by Signature Theatre, Classic Stage Company, The Juilliard School, HERE, and The Zipper, which his production of TRUE LOVE opened in 2001. He has also created work for Düsseldorfer Schauspielhaus, The Royal Shakespeare Company, The Richard B. Fisher Center for the Performing Arts Shakespeare Theater. Daniel Fish has taught directing at The Yale School of Drama, Princeton University, University of California at San Diego, and Bard College. World renowned mezzo-soprano Stephanie Blythe joined us at CCM Opera on Thursday for an inspiring two hours of conversation and Q&A with students and faculty. Ms. Blythe recently performed the role of Fricka in Wagner’s Opera Die Walküre live from the Metropolitan Opera HD Broadcast. She will be singing this Saturday May 28th in Mendelssohn’s Elijah at the Cincinnati May Festival. Mezzo-Soprano Stephanie Blythe visits CCM Opera this Thursday from 2:00pm – 4:00pm in DVAC 300 for a Q&A session with CCM Opera students and faculty. Ms. Blythe was most recently featured in the Metropolitan Opera’s HD production of Wagner’s Die Walküre as Fricka. This session is open to all CCM Opera Students and Faculty.